The 2017 presidential election will not be without a contest. And it will see a Dalit versus Dalit. 17 Opposition parties announced that former Lok Sabha Speaker Meira Kumar will be their joint candidate against the ruling NDA’s presidential nominee Ram Nath Kovind. The 2017 presidential election will not be without a contest. And it will see a Dalit versus Dalit. 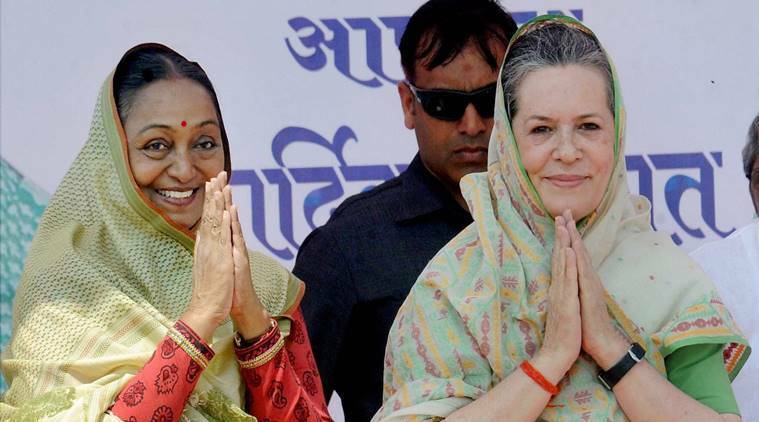 Seventeen Opposition parties Thursday announced that former Lok Sabha Speaker and Congress veteran Meira Kumar will be their joint candidate against the ruling NDA’s presidential nominee Ram Nath Kovind. In the end, Uttar Pradesh arch rivals SP and BSP went along with the Opposition choice and did not go the JD(U) way which backed Kovind — RJD’s Lalu Prasad called Nitish Kumar’s decision a “historic blunder” and “wrong decision.” He said he would meet the Bihar Chief Minister Friday and “urge him to review his decision… I will tell him not to commit a historic blunder”. He called Meira Kumar “Bihar ki beti” (daughter of Bihar). Daughter of former Deputy Prime Minister and Dalit leader Babu Jagjivan Ram, 72-year-old Kumar, MP for five terms, is also from Bihar which Opposition parties think will have Nitish Kumar in a spot. At the meeting, leaders said that Kumar’s decision to support Kovind’s candidature was “most unfortunate” and that “he should not have done it”. Although the decision to field Kumar was described as unanimous, sources said NCP chief Sharad Pawar’s first choice at the meeting was Sushil Kumar Shinde, Congress leader from Maharashtra. But all others favoured Kumar’s candidature. That the candidate would be a Dalit was a foregone conclusion as there was pressure on the Congress and others from parties like the BSP ever since the BJP announced the candidature of Kovind. The Congress and other Opposition parties had been working overtime to come up with a Dalit candidate as the challenger although the numbers in the electoral college are stacked in favour of Kovind. Sources said Leader of Opposition in Rajya Sabha Ghulam Nabi Azad and Ahmed Patel had sounded Pawar about Congress president Sonia Gandhi’s desire to field Meira Kumar. CPM’s Sitaram Yechury was also part of informal discussions through the day. At the meeting, Gandhi spoke first, but did not take any name. Pawar was next and named Shinde, Bhalchandra Mungekar and Kumar, in that order. Sources said he pushed for Shinde and Mungekar since both are from his home state of Maharashtra. But Lalu Prasad, who spoke next, spoke in favour of Kumar. Sources said all who spoke later, including SP’s Ram Gopal Yadav and BSP’s Satish Chandra Mishra, backed Kumar’s candidature. Yechury and his CPI counterpart S Sudhakar Reddy mentioned that the Left had thought of proposing the names of Mahatma Gandhi’s grandson Gopalkrishna Gandhi and Prakash Ambedkar but would go with the consensus. Gandhi was out of the race after the BJP named Kovind. Yechury said Gandhi himself told him after Kovind’s candidature that the parameters of the candidate selection will have to be changed. At the meeting, Left leaders did not press for Ambedkar either which meant that a consensus had been reached before the meeting itself. Kumar’s candidature was announced by Gandhi with Pawar next to her. Asked whether she would appeal to Nitish Kumar to support Kumar, Gandhi said she would appeal to all parties to back Kumar. “We do hope that other opposition parties join us… We are also proud that she is the second Dalit candidate for the post of President,” Gandhi said. After the meeting, all leaders were asked to say back and sign various sets of nomination papers for Kumar. Nine MPs from eight Opposition parties signed the papers then and there. Apart from Gandhi, those who signed the papers include former Prime Minister Manmohan Singh, Yechury, Pawar, Derek O’Brien of Trinamool Congress, Satish Chandra Misra, Ramgopal Yadav, DMK’s Kanimozhi and D Raja of the CPI. Pawar’s proposal of announcing the candidate on Friday since some of the top leaders were not present was opposed by several parties who insisted that the paperwork too be initiated before the end of the meeting. After JD(U) broke ranks, the parties clearly wanted to avoid any more last-minute desertion. Other leaders argued there was no point in withholding the name when the decision has already been taken rather than media speculating or revealing the name. Left leaders, who are in touch with the Aam Aadmi Party, said Arvind Kejriwal will come out in support of the Opposition candidate. While the JD(U) deserted the Opposition camp, RLD’s Ajit Singh, who was not present at the last meeting, attended the Thursday meeting.